I hope everyone had a fabulous Christmas! Mine was great but ate way too much! 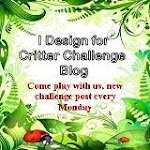 I'm super excited to be able to announce that I am now a DT Member beginning in January over at the Critter Sketch Challenge Blog! Check out this post for the list of the new DT members! There are new challenges posted every Monday, so I hope you will play along with us! I was looking for a quick & easy gift card holder tutorial today and happened to come across a blog called Strictly Stamping that had posted some examples with a link to a tutorial over at Stamp TV. There is a Part 1 & Part 2 video on Youtube which gives all the details, dimensions etc to make these. So quick and easy it took me less than 10 minutes to do! Would be great for any time of year and can be decorated to suit any occasion. This one will be for my nephew at Christmas! 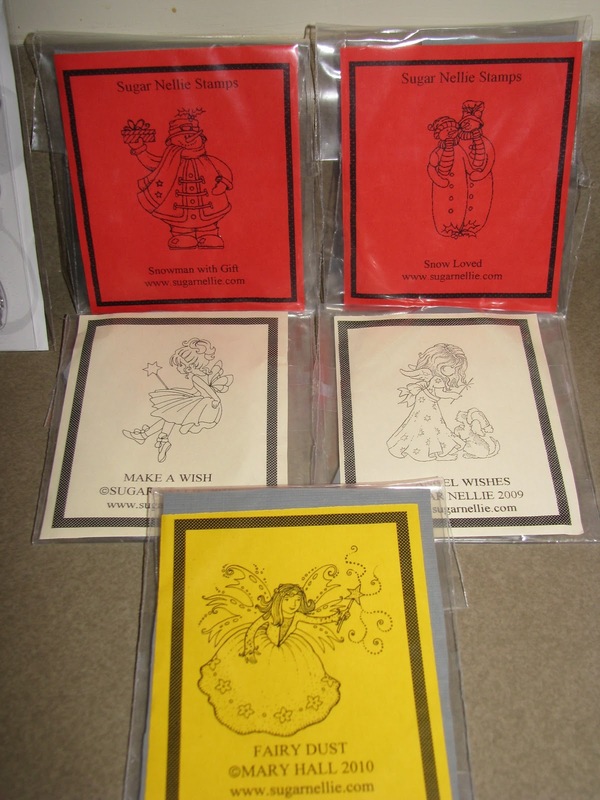 All cardstock is Bazill and the Jingle Bells DP is by Sweetwater Designs which I got last year. I also used a Stampin Up "Do not Open until Christmas" stamp from the Perfect Presentation set and cut it out with my circle nesties & added a scallop circle for the background. The band to hold the card holder closed was punched with a Fiskars Border Punch. 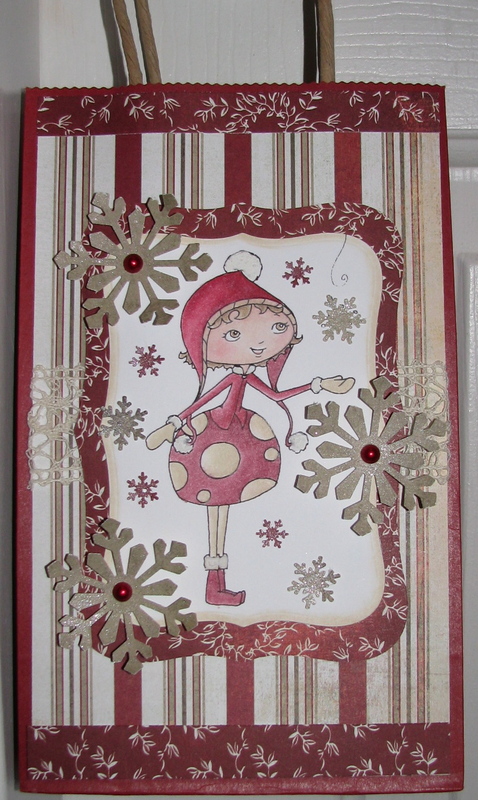 Other Supplies used: Swiss Dots Cuttlebug Folder & Tim Holtz Distress Ink in "Old Paper". Paper Sundaes Challenge #49 - Cut it Out! 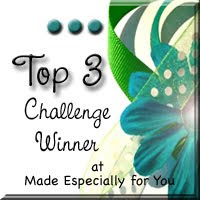 It's time for another challenge over at Paper Sundaes - Challenge #49's theme this week is "CUT IT OUT". For this challenge we want to see you cut out your image for your card! This can involve just cutting out the image, paper piecing or anything else you can think of that involves cutting it out! We are being sponsored by our fabulous monthly sponsor "Simon Says Stamp" so be sure to play along for your chance to win a $15 gift certificate to their store! This challenge will run for 2 weeks due to the Christmas holiday so you'll have plenty of time to play along! Not what I had planned exactly for this week but due to some crafting issues this week will have to do. I used this fabulous stamp by Hero Arts called "Thank You" which I got from Simon Says Stamp a while ago now but haven't had a chance to use. I coloured with copics and then cut out the image & layered it on my card with some of the Spellbinders Nestabilities Labels 8 Dies, added some pearls and ribbon and had a nice simple Thank You card for my collection! All design paper except the cardstock I believe is from the Basic Grey Eskimo Kisses Collection. I also re-stamped & cut out the Thank You sentiment and used pop-up dots to add a bit of dimension. I hope everyone has a fantastic holiday & a wonderful new year! I'm so EXCITED! Now normally I hate trying new things because I'm always afraid I'm going to mess it up BUT I finally had some free time & decided to try out an SCS tutorial on transferring stamped & coloured images on to candles. It is the easiest thing EVER! A huge, huge THANK YOU to my Paper Sundaes DT Gals Alica & Lisa for making these for the Paper Sundaes "Gift it" Challenge last week. If I hadn't seen their beautiful creations I never would have tried it out. If you click on their names you can check out the fabulous candles they made. I used a Magnolia image "Tilda with Christmas Tree" and stamped her on the tissue paper, coloured her with copics and prismacolor pencils, and then very carefully followed the tutorial instructions to finish it up. On the back of the candle I stamped a Christmas verse from a Stampin up set I have. Now I'm off to add some jewels and finish it off. I was just so excited couldn't wait to share!! Definitely check out the tutorial & try it because if I can do it YOU CAN TOO :) I can't wait to give this away at Christmas! Hope everyone is having a fantastic weekend! I'm so chilled to the bone right now! I just got back from my son's cub outing which was a campfire with songs, skits & hot chocolate. It was a lot of fun but poured rain the whole time. The kids had a blast though! It's time for another Paper Sundaes Challenge, #48 to be exact! This week it's a fun challenge, create a card, anything but a square! This week we are being sponsored by Meljen's Designs and the DT girls got to use some fabulous images! I chose to use the image Caroling Snowmen because I LOVE SNOWMEN! 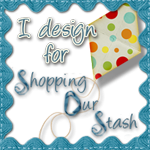 You can pick up this image over at Whimsy Stamps along with many other Meljen's Designs images. The DP on the inside is Fancy Pants Designs: Glistening Snow and the sentiment stamp is one I picked up in a thrift shop ages ago. 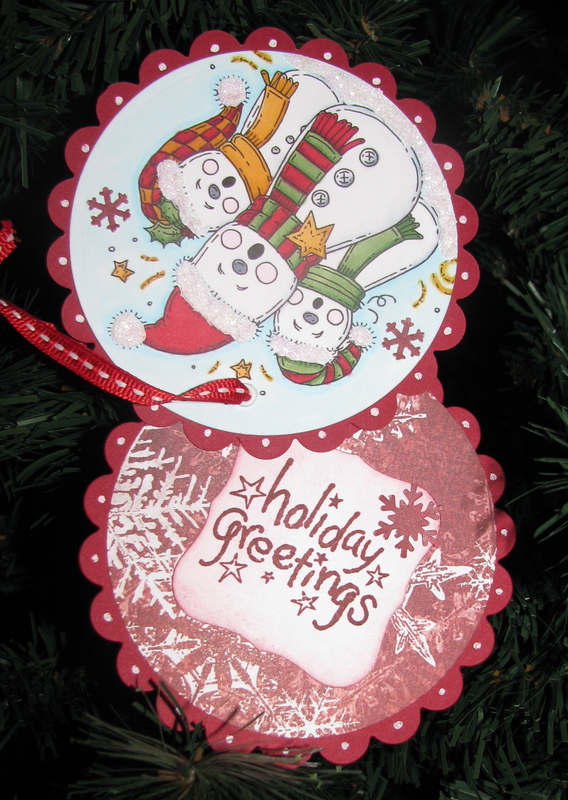 I also punched a couple of mini snowflakes and added them to the front of the card & one inside. I added some texture with some Snowtex and then added some glitter on top! I was at least happy to see that I could actually tell there was some glitter on it in the photo!! This is something I'm still working on mastering. 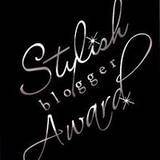 Thanks Lisa for the Stylish Blogger Award! It was such a great feeling to receive an award from fellow blogger Lisa! I love to visit her blog to see what gorgeous creations she has made & to listen to the fabulous music she always has playing! 1. I'm so honored to receive these type of awards but honestly dread thinking of 8 things to share about myself because I can't think of anything interesting about me. I received one once before (Thanks Pattie) & didn't share because of this - SO SORRY! 2. I have the most fabulous best friend in the world. We first met when we were in Grade 7 (once) and then again when we were in Grade 10 & have been friends ever since. She is also married to someone I went to elementary school with since Grade 7. I can't imagine my life without them. 3. I love to make cards & shop for supplies (don't we all) and my best friend says that it's like a store at my house but I think she is CRAZY!! Aren't we all like this?? Please tell me this is true :) Otherwise, my name is Crystal & I have a stamping/papercraft addiction!! Is there a 12 step program for that? 4. My mom passed away when I was 19 and when people say things get better over time, they are wrong! I miss my mom just as much EVERY day! 5. I joined Weight Watchers 13 weeks ago and have lost almost 19 lbs, YAY ME!! 7. On the same Seattle road trip to Bon Jovi, my best friend Jen & I drove to Oregon so we could eat at the Carver Cafe where scenes from the first Twilight film were done. We even sat in the same spot that the characters Bella & Charlie sat & ate at. We also visited the high school known as "Forks High School" in Twilight. (Her obsession - not mine but shhhh.....don't tell her that even though I complained I couldn't believe we were actually going there I secretly had a blast)! 8. I love to go to the movies! I would go every single day if I could. Love getting lost in the storylines & LOVE, LOVE, LOVE the popcorn! So enough about me.......Here are 8 bloggers I would like to share this award with, some recently discovered, some I've watched for awhile now!! Prairie Fairy Spread the Word Candy! Looks super YUMMY to me! Be sure to stop in at the Prairie Fairy blog to read up on the details. Paper Sundaes Challenge - Gift it! Happy Sundae! 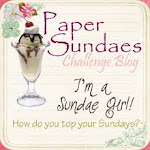 What a crazy week it's been for me but I was sure looking to our Paper Sundaes Challenge this week! The Challenge this week is "Gift it"! That's right create something that you intend to give away as a gift. As soon as I found out about this challenge I knew I wanted to create a gift bag (one of many I'll be making) because I always bake sweet treats & other goodies at Christmas time for my family & thought it would be a fun way to package them up. I think I'll put some cellophaned wrapped caramel corn or fudge in this one. 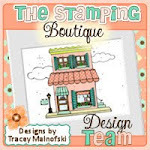 Stamp & Create is our sponsor this week and I love this store! If I had endless supplies of money I would shop there all the time since Lacey always has great sales and the shipping is FAST! This image by CC Designs called "Sweet November - Sprite Darby & Pudge" was one I fell in love with as soon as I saw it! I coloured her with my new Prismacolor pencils and I think I LOVE them as much as my copics!! Never, ever thought I would say that!! Once coloured I cut the image out with my Spellbinders Labels Eight and began adding snowflakes. The larger snowflakes were all cut out using a Martha Stewart punch and the little snowflakes were cut out using and EK Success Punch. All of the paper is all Basic Grey Wassail from last season & the crochet lace ribbon was some that I had purchased from Stamp & Create this past summer. I also sprayed the snowflakes with Glimmer Mist however it doesn't show up as well in the photo as it does in person. He also brought me back some delicious scottish shortbread & tablet which I'd never had before and is so good!! We had a wonderful birthday celebration tonight and the most amazing Tuxedo cake! YUMMY! Thanks to everyone who entered my blog candy post & for the birthday & 100 posting wishes! It's been so much fun & I'm happy to pass on these goodies to somebody :) I loved hearing all your wonderful crafting tips & organizational ideas & will be putting some of them to good use! Congrats Jamie!! I just sent you an email so if you get back to me I'll package up your goodies (and maybe throw in a few extras) and have it mailed out to you by the end of the week!